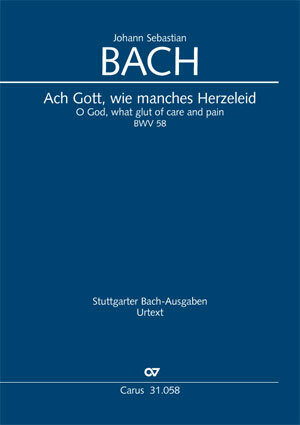 The cantata "O God, what glut of care and pain" BWV 58, which Bach subtitled "Dialogus" and wrote for the Sunday after New Year, limits itself accordingly to the dialog couple consisting of soprano and bass; further soloists or a choir are not required. In the framing movements, the dialog takes on the form of a chorale arrangement: the soprano presents a cantus firmus whose words are consolingly commented on by the bass. Both the expansive chorale arrangements leave room for an aria which is framed by two recitatives. The cantata was composed for the Sunday after New Year 1727, but the received form is from a subsequent performance that took place six or seven years later. For this performance, Bach not only expanded the instrumentation but also replaced an entire aria. Later, he assigned the cantata to his annual cycle of chorale cantatas, probably due to its high proportion of chorales; this Sunday was missing in that annual cycle as there was no Sunday between New Year and Epiphany in 1725.